Things that bring a smile to your face? Ireland. I think it's just so pretty, I've never been there so I might be wrong, but for now that's where I'll choose to live. I think Nicholas Sparks, I love the way he writes and his characters and all of the books I've read. What would we write about? That I'm not sure, maybe he could help me with mine. I don't think I have a favorite saying but if you asked my friends, they'd probably say is one of the words I use the most, I'm not even sure which ones I use most. What book were you talking about reading together? Under the Never Sky, with us @ the YA Blogger Book Club next month, well. we'll be starting it in one week. I heard Ireland was really pretty! A girl I graduated high school with did a study abroad over there and from what I could tell, she had a blast. The pictures were amazing! If I had to pick a boy from a book to be my boyfriend, Tobias all the way :) He's perfect even with his flaws. I can't wait to see who is cast to play him in the movie. Ireland is a popular answer :) It would be could to co-author with Nicholas Sparks. 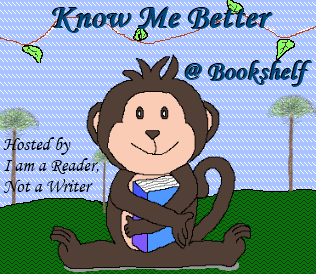 Here's my Know Me Better post. I love Tobias too! He and Tris are great together. I'd love to visit Ireland someday; it looks like such a beautiful place. I can't believe I forgot to mention books in my list of things that make smile because they certainly do!